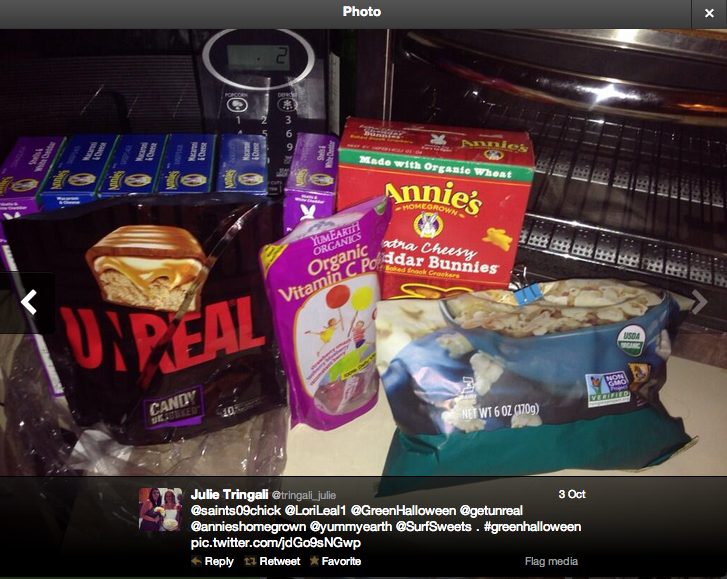 We held recently a twitter party to share healthy Halloween tips. In case you missed it (don’t worry, there were quite a few folks who had to put their little goblins to bed!) we’ve compiled a list of the best #greenhalloween tricks and treats. Thanks to all our wonderful party-goers for their great suggestions! Have your child eat a full meal before going out. Make sure your child eats two rainbows of produce two weeks before and after Halloween. Learn more at Today I Ate a Rainbow. Trade candy for Legos or other toys. Bring candy to work the next day (the office my suffer from a sugar high, but the candy is bound to disappear quickly). Pack your own healthy treats for your child to have while walking from house to house. Later, donate the candy s/he acquired. Try reverse Trick or Treating. 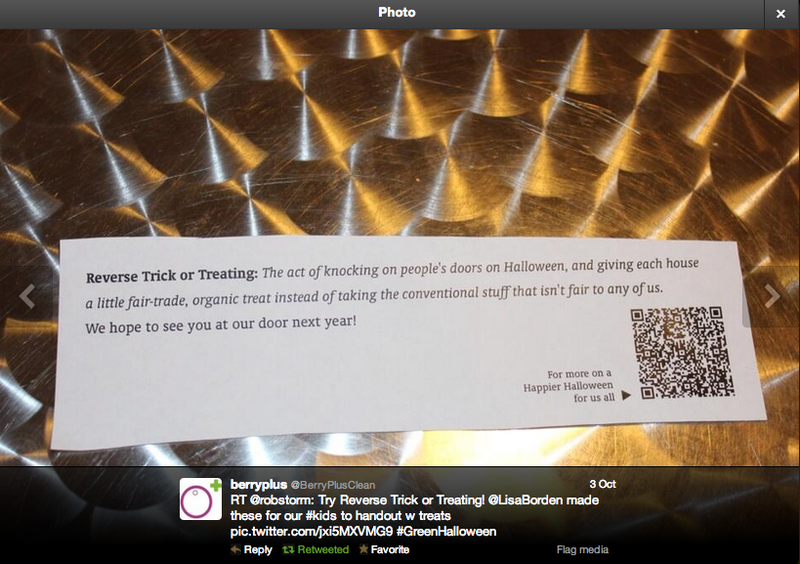 Instead of taking junky candy, go to your neighbors and give them a fair trade gift. Help empower workers. Campaign for Safe Cosmetics found 10 out of 10 Halloween makeup kits tested contain lead! Stay safe and make your own face paint. Who says piñatas have to be full of candy? Fill that baby up with little prizes! Grow your own pumpkins! Can you get it to be this big? “Disposable?” More like reusable! Wash your plastic cutlery to use for all your parties. Or, try bamboo picnic ware. Need some fun, eco-party inspiration? Try a Healthy Child Party Kit. Boo! Chocolate Banana ghosts are so good it’s scary. Fair Trade Your Halloween Kit! It comes with Equal Exchange mini chocolates and informational cards! Hair bows and hair bands. Extra points of you make these yourself. Honest Tea - stay hydrated while going around the neighborhood. Annie’s snacks – one party-goer came prepared with all her favorites! This entry was posted on Tuesday, October 8th, 2013 at 3:00 am	and is filed under Costumes, Gifts, Halloween makeup, Recipes, Resources, Treats and Treasures, Updates and announcements. You can follow any responses to this entry through the RSS 2.0 feed. Both comments and pings are currently closed.